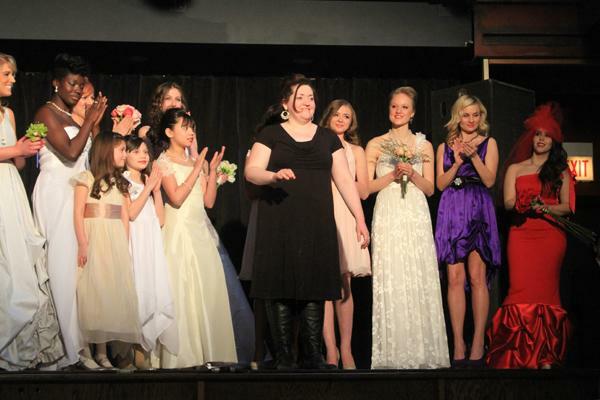 Rachel Alvia, owner and lead designer of Avail & Company, thanks the crowd at the end of a wedding gown fashion show Sunday. The show was part of Evanston's first wedding walk program hosted by Downtown Evanston. Evanston resident Jessica Wong did not expect to win a wedding gown when her friend signed her up for the city’s first wedding walk. The bride-to-be was among 50 people who participated in the walk on Sunday, which featured local vendors, a fashion show and a raffle. Wong won a handmade gown worth $3,000 in the raffle. Downtown Evanston organized the event to promote local vendors providing wedding services, said Carolyn Dellutri, executive director of the business association. “We’ve got all the things that someone would need to plan their wedding and have their wedding here in downtown Evanston,” Dellutri said. The walk began at noon, with participants registering at Hilton Garden Inn Chicago North Shore/Evanston and Hilton Orrington, where they learned about the banquet facilities at the hotels. Melissa Powles, director of catering at Hilton Orrington, said she hopes the event would attract more business for the hotel. “We’re helping to showcase Evanston as a wedding destination,” Powles said, adding that the hotel gave participants a tour of their grand ball room. Dellutri said her organization promoted the wedding walk locally as well as around the Chicago area, with an advertisement in Chicago Bride magazine and through a Facebook campaign. Libertyville, Ill. resident Trish Eckhart was one of those who received Dellutri’s emails about the event. Eckhart’s daughter Jenny (SESP ’09) plans to host a reception at Hilton Orrington for her upcoming wedding. On Sunday, Eckhart and three other moms participated in the walk to check out wedding supplies in Evanston. The city’s vicinity to Chicago and Lake Michigan makes it an attractive wedding destination, Eckhart said. The walk culminated with a wedding gown fashion show at the restaurant 27 Live, 1012 Church St., where a dozen models showcased handmade gowns from Avail & Company. Rachel Alvia, lead designer and co-owner of the company, said Downtown Evanston contacted her about the event since her company moved to the city in August. “The show was a lot of fun,” she said. The raffle at the end of the fashion show featured prizes including a crystal and pearl necklace, a party at 27 Live and the gown won by Wong. The Sunday event helped her with ideas for her wedding, Wong said.